I love sheepskin boots, also known as Uggs. The luxury of not having to wear socks, and being able to jump straight from my bed, into my Uggs makes my day! I'm really lazy that way. But there's something odd going on: Uggs Australia has such a firm hold on the Ugg market, sheepskin boots from other companies are considered fake! I don't like anything fake, but I don't feel the need to pay for a specific brand, so when I read about Whooga Uggs my heart beat faster: finally real sheepskin Uggs I could afford! So I visited the Whooga Uggs website and put their button on all of my blogs so I could win a pair, and then I held my breath waiting for my name to be called out. Unfortunately that took too long, a girl has gotta breathe sometime, so I send them a friendly email offering to review their Whooga Uggs. Out of the kindness of my heart of course. Then I held my breath again. Unfortunately nothing happened, so I took another breath and forked over 129 dollars and bought myself a pair of black Classic Talls. 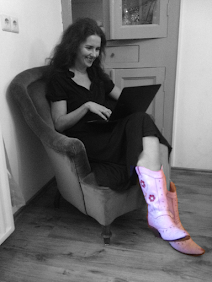 So now I can share my experiences with Whooga Uggs Classic Tall unencumbered by bribery or free Uggs! Although, and I can't stress this enough: if anyone would like to offer me some free Uggs to review, they are more than welcome! So, here's my review of Whooga Uggs, Classic Tall. The first thing you notice is the price: Whooga Uggs are significantly cheaper than Uggs from Uggs Australia. A pair of Classic Tall Uggs cost 129 USD. Shipping costs are another 15 dollars, which brings the grand total to 144 USD. The same kind of Uggs from Uggs Australia cost 180 USD. To get your Whooga Uggs even cheaper you can use a coupon code, which gets you a discount of about 10 USD. Unfortunately my discount code, which I found on the internet, had expired, but I got the discount anyway! So be sure to use a code! Are Whooga Uggs made for walking? On the Whooga website there's a nifty size chart, which allows you to measure your foot, and then offers you your right size. Normally I am a roomy size 7, but according to the size chart I should buy a size 6 because 'the sheepskin wil stretch to fit the contours of your feet'. The same thing is recommended when buying Uggs from Uggs Australia, so I went for the size 6, and they are fine! The first time they were a little bit itchy, and I found myself scratching my legs. But after a few days the itchiness disappeared. They are definitely made for walking! I almost sobbed out loud when I put them on, and my feet were welcomed by warmth and comfort. Firstly I'm terribly sorry for the condition the boots were presented in. 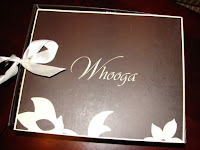 We really value that first impression which is why we put so much time into the Whooga box. We recently moved to a new freight provider (DHL) and while they have been significantly faster we've had this issue with a small number of boots. The DHL agent removed our boxes without our consent (we speculate this was done to save money on their end). We've since rectified this issue which I understand doesn't help you. The Whooga Uggs smelled quite heavily, something else I had read about. But like the itchiness, the smell disappeared fast. One of the things I like about my Whooga Uggs is the little flower at the back. As for the finishing, I am less impressed. The soles looked like they had just been cut out, and were a bit frayed. And was that a bit of spilled glue I saw? When I put my hand into my Whooga Uggs I felt the distribution of wool was a bit uneven. At some spots there's more wool than on others. Even though the finishing leaves something to be desired, I still think Whooga Uggs are a very good alternative for the much more expensive Uggs Australia. After all: they are made of sheepskin and they are very comfortable. They smell heavily when they arrive, but if you're into glue sniffing you might quite like that. They're not useful on slippery slopes! I alsmost broke my neck once, slipping on an icy patch. Always use a coupon code, even if it's an old code. The coupon code I googled got me a discount anyway.